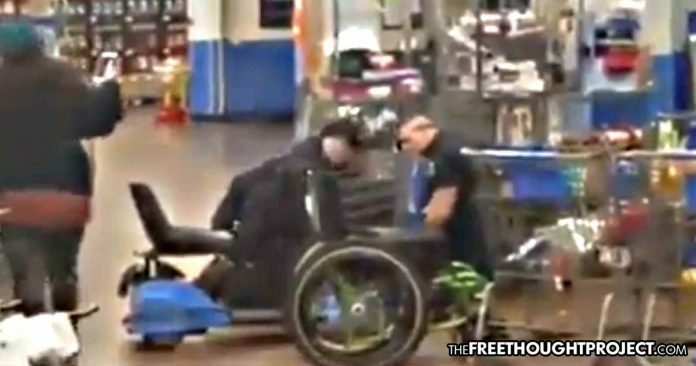 (Support Free Thought) – Muskogee, OK — An infuriating video was uploaded to social media this week showing multiple police officers attack a disabled veteran in a Walmart. The veteran was pulled from his wheelchair, thrown to the floor and pepper sprayed after asking for the store’s policy on showing identification to purchase alcohol. Sadly, veterans being abused by the government they put their lives on the line to defend is an all too common issue. One need only look through our archives to see the horrid abuses faced by those who fought for this country.